The only holiest place in Tamil Nadu is rameshwaram which part of char dham piligrimage. According to Hindu mythology every person should visit rameshwaram once in their life. What's secrets behind the small island. Why visitors of rameshwaram increasing by yearly, is there any specific reason rameshwaram has..? Offcourse! When the devotees entering in the pamban bridge, they feel to enter in the new world of heaven. Not only Pamban connects rameshwaram but also it connects hearts of devotees further Pamban bridge has been seen lot of occurrence such as cyclone, winds and storms since 1964. Apart from natural disasters it has been crossing tourists and devotees. Pamban accomplishes to do devotees rituals and prayers. 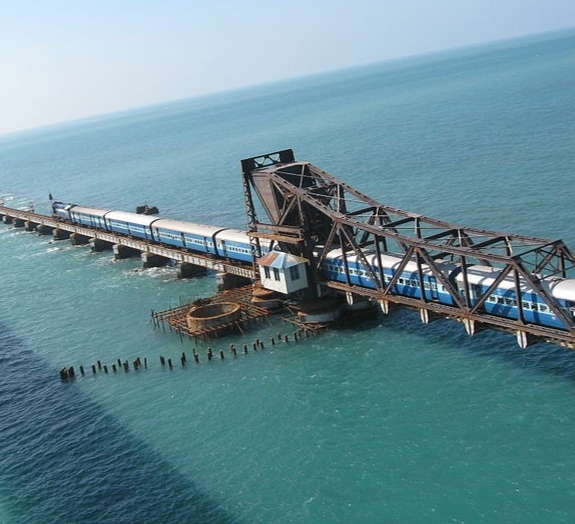 The above image shown you train crossing on pamban bridge. 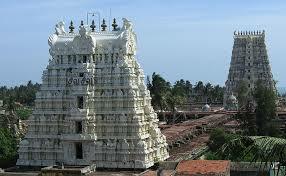 When the visitors reached rameshwaram, they will not complete their journey without worship of Ramanathaswamy temple. If people want to know the history of ramanathaswamy temple, they want to learn epic ramayana, Lord Rama 7th avathar of Vishnu and he was returned from colombo after killed ravanan. Rama wanted to absolve his sin from killing ravanan which he decided to built the temple so sita Devi accumulate sand from her both hands thats the place lingam appeared what called today ramanathaswamy temple. Even the temple was developed in 12th century, it was praised by Appar and Tirugnana Sambanthar in 7th century. Which also consider one of the jyotirlinga temple. There are lot of devotees from States of India absolve their sin by worshipping the temple. We cannot see any other temple in india contains longest corridor but ramanathaswamy temple has longest corridor in india. The above image you developed tower of ramanathaswamy temple by pandya dynasty. Devotees becomes torists in Dhanushkodi, apart from pilgrims, lot of tourists excited to put the foot on ghost town. Why it called as ghost town that taking backward to 1964. Intially the passenger train was running untill dhanushkodi later it was abandoned since the 115 passengers and 1800 lives was dead in 1964 cyclone. Consistent cyclone, rain and storm destroyed the place entirely and the lives was merged into the bay of Bengal. Their soul was not rest in peace which surrounds the place and became ghost town. Dhanushkodi railway station make people to imagine cyclone of 1964 which also recall us to passenger train from madurai to Dhanushkodi. 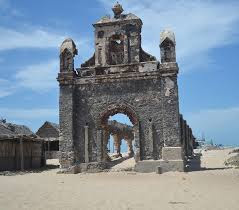 The above image shown you ghost town of dhanushkodi. There are lot of bridges in India but Adam's bridge was spectacular since it was under the sea. 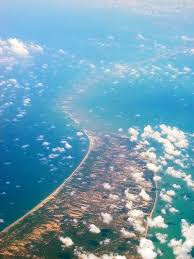 The above image shown view from air of Rama sethu bridge. The devotees of rameshwaram calls it as epic bridge which tell us to important of ramayana. Connecting of two hearts become affection similar connecting of two nation's makes culture. Rama setu bridge expanded culture from India to srilanka. When tourists stands near the bridge, they can imagine themselves how the Rama was love sita Devi. Rama wanted to rescue sita from ravanan so he was constructed the bridge by his vanaras. The people believe that true love does whatever in world by seeing the Rama setu bridge. Untill the earth survives, Rama bridge and ramayana will not be hidden from the world. Most of the people doing sin to others in this world which common for all people's such as celebrities, politician and other professional workers. They wanted to absolve their sin by bathing 64 thirthas in rameshwaram. This thirthas able to soluble the sin of devotees. The devotees who come with sin, they bath mainly in agni thirthas which front of ramanathaswamy temple. There are 22 thirthas found in the temple of ramanathaswamy. 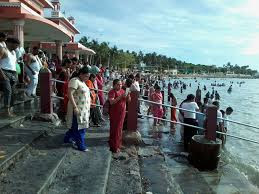 The east coast of the beach in front of the temple meets lakhs of people during full moon day. Adi and Thai Amavasai(new moon day) busiest day of bay of Bengal southeast which devotres pay rituals for their ancestors. We are not sure whether this 64 thirthas found in any other place of world but the grace of lord shiva, Rameshwaram thirthas soluble sin and lead the life to be moral. When sita Devi started to accumulate sand, vaishnavism and shakthism started to merge that's what rameshwaram meets across the religion and countries. The nearest airport of the ramanathaswamy temple is madurai airport that away from 180Km. The nearest railway station of the ramanathaswamy temple is rameshwaram railway station that away from 2Km. Boat mail, sethu express and madurai Rameshwaram passenger trains are available on daily basis. The nearest bus stand of the ramanathaswamy temple is rameshwaram bus stand that away from 2Km. There are national highways NH49, NH87 connecting to rameshwaram. 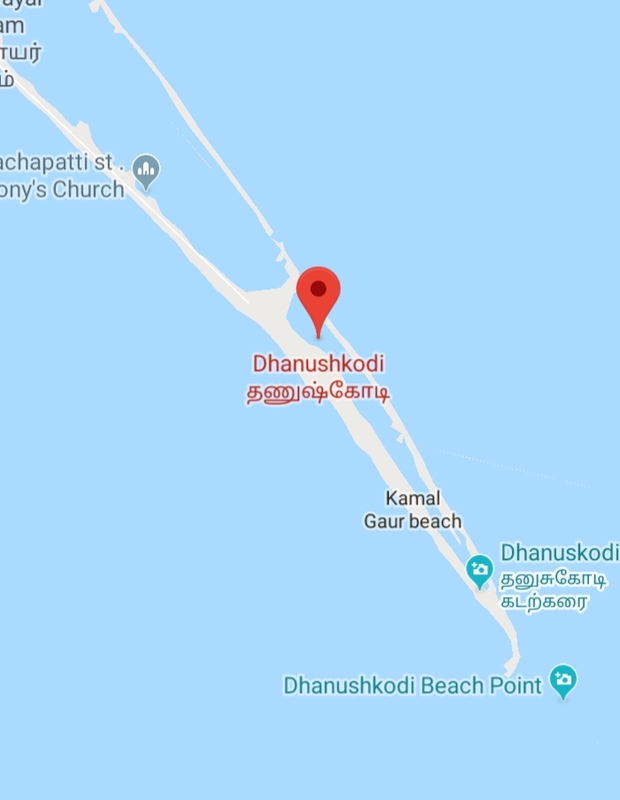 There is no direct flights and trains available to Dhanushkodi. The passenger train from madurai to Dhanushkodi was abandoned due 1964 cyclone. Only way to reach Dhanushkodi by Road which takes 19Km from Rameshwaram. There are government buses, private buses run Dhanushkodi further Auto and Jeep available for bargaining fares. From tip of dhanushkodi people can visit Rama setu bridge(Adam's bridge).